Quarterback Aaron Rodgers has lifted the Green Bay Packers to first place in the NFC North after three consecutive wins. If anyone still questions the existence of “Football Gods” they need only refer to Week 5 of the 2017 NFL season. Clearly, there were unseen forces at work manipulating the fate of several teams. 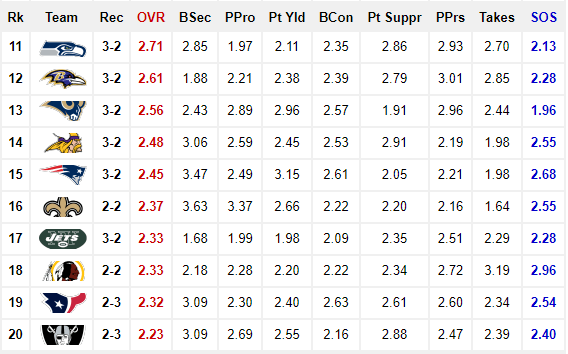 Regardless, divine intervention or not, our Week 5 BES Rankings will attempt to make some sense of the madness. 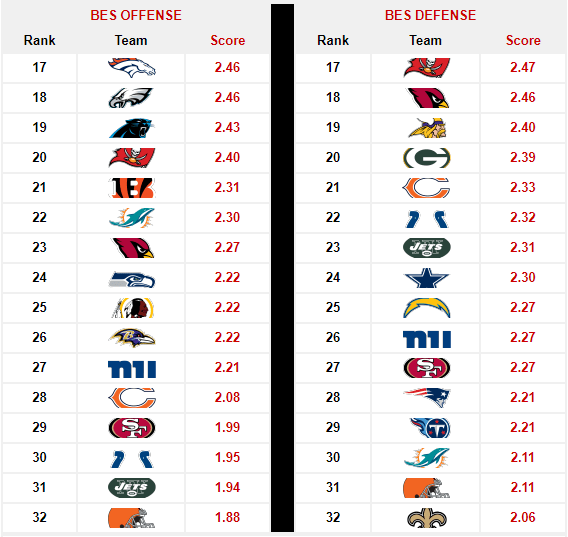 The BES had been 30-18 (.625) in Weeks 2-4 predicting game outcomes based on its rankings. However, it was as if we angered the football gods who then turned the sea against us, thrashing our ship with monstrous waves and bashing it against jagged rocks. What remained amid the shards of driftwood was a 6-8 (.429) record in Week 5 based on our Week 4 report. That brings us to a 36-26 (.581) mark on the season thus far. Hopefully, the worst is behind us as we salvage what we can and forge ahead. 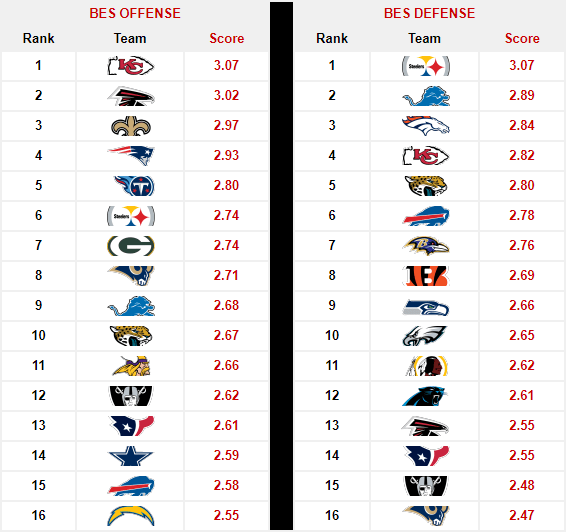 As we enter the season’s second quarter we find two new teams among the top-5 in our Week 5 BES Rankings. One of those teams is the Packers (4-1). They are riding the momentum of a three-game winning streak and a remarkable last-second road win against the Cowboys (2-3) in Week 5. As a result, the Packers have jumped from No. 8 to No. 3 in BES Overall. However, they’ve fallen dramatically in BES Defense, from No. 10 with a score of 2.71 to No. 20 with a score of 2.39. That is a concern as their next two opponents are the Vikings (3-2) and the Saints (2-2) who rank No. 11 and No. 3 respectively in BES Offense. 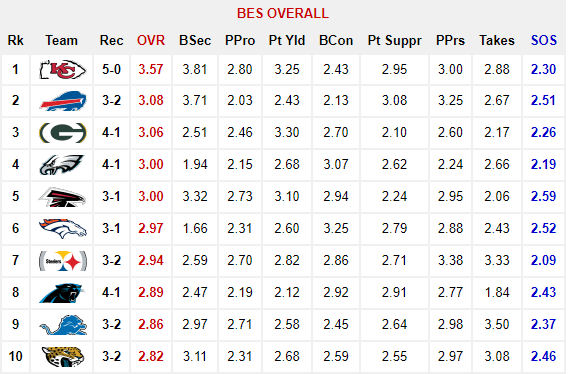 Though the Chiefs (5-0) BES Overall score dropped slightly from 3.62 to 3.57, they remain No. 1 for a fourth consecutive week. Additionally, the gap between them and the rest of the field has expanded to a daunting +.49 points. Obviously, much of that is due to the Chiefs being the only undefeated team. However, it’s also due to them stalling the momentum of surging opponents. The Eagles (4-1), Redskins (2-2) and Texans (2-3) were three teams coming off impressive wins when they encountered the Chiefs. Conversely, in Week 6 the Chiefs face the Steelers (3-2) who are reeling from an embarrassing 30-9 loss to the Jaguars (3-2) at home in Week 5. Most notably, Steelers quarterback Ben Roethlisberger threw a doom-sealing five interceptions which the Jaguars converted into 27 points. 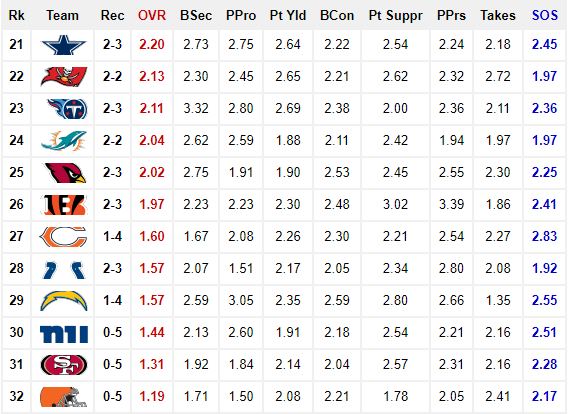 Therefore, the dynamics of this matchup deviate from the norm of the Chiefs season thus far. 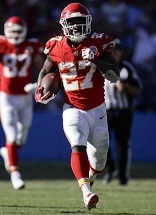 Either way, the game should be one of the best in Week 6 considering it pits the Chiefs No. 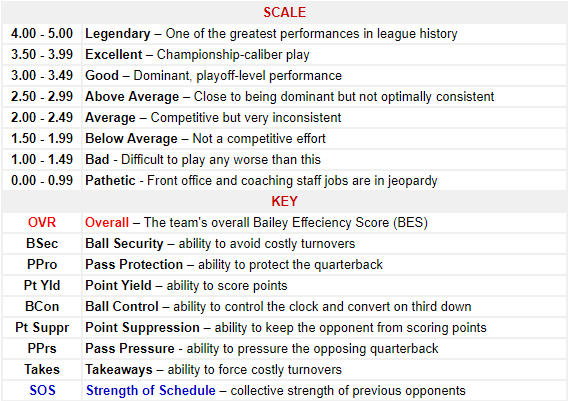 1 BES Offense against the Steelers No. 1 BES Defense.